The other day at the park there was a dog doing all sorts of tricks; she was rolling over, turning, jumping on command, and even waiting a long time after a ball was thrown to chase it. What a show off. I could do that if I wanted to. But, I don’t. I am not a circus dog. When I was a puppy, Crazy Blonde decided to teach me all sorts of things. First she taught me to sit, stay and lie down. Easy. Then Crazy Blonde got it into her head to teach me tricks. I heard her tell a friend she is like a dog whisperer because she was able to get my good buddy Bogart to do all sorts of funny things. She was determined to get me to do them too. Crazy Blonde took a big bag of my favorite treats and started to teach me how to shake and give a high five. It was fun to learn and apparently it is really endearing because every time I do it people make cooing noises. After a while, though, I got really bored. I really don’t want to learn how to roll over, or speak, or crawl. I especially hate it when Crazy Blonde puts a treat on my snout and expects me to wait until she gives the command for me to eat it. Really? You know you are going to eventually give me the treat, so why wait? I overheard Crazy Blonde lamenting that she can’t teach me tricks. But, I can do lots of other cool things. I can jump really high and catch a Frisbee. I am an excellent running companion and go really far without getting tired. I can out maneuver all of the other dogs. And, I am super cute. Also, I am very smart. I understand lots of words and phrases. If Crazy Blonde or Deep Voice asks if I want to go the park, I jump up and down because I know they are taking me to my favorite place. When I am napping on my bed and someone says, “do you need to go to the bathroom”, I hop right up and walk to the back door. I understand what it means when I am asked if I want a treat – duh, of course I do. I know the difference between my running leash and my walking leash. I can eat an apple off the core like an ear of corn. When I run with Crazy Blonde, I always look over my shoulder for cars before we cross the road. I know I shouldn’t bark so much, but I do it anyway. So, Crazy Blonde and Deep Voice: I know what I am good at and I am going to stick to it. If you want a circus dog, go get a Golden Retriever. As a coach, I am put in the situation of giving advice. 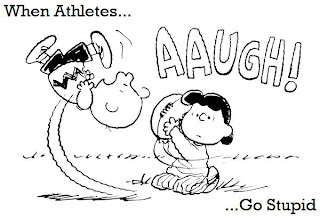 Athletes call or email with questions on a daily basis, tasking me with problem solving a multitude of predicaments. This, though, is my favorite part of coaching; helping athletes through these tough patches. Directing athletes through the nuances of daily training or why a race went wrong or how to properly pace for the perfect race is the crux of coaching. It’s like solving a puzzle, and I love puzzles. “Should I workout today, I am feeling sick?” No, take the day off and get better so you can hit it hard tomorrow or the next day. “I have an ache or pain, what should I do?” If it has lasted for more than a few days or is getting worse, see someone. “I have had a few bad days in a row.” Time for a rest. I’ll modify your schedule for a few easy days. “I completely blew up on that workout, why? “ It sounds like you started off too hard. Next time dial it back. 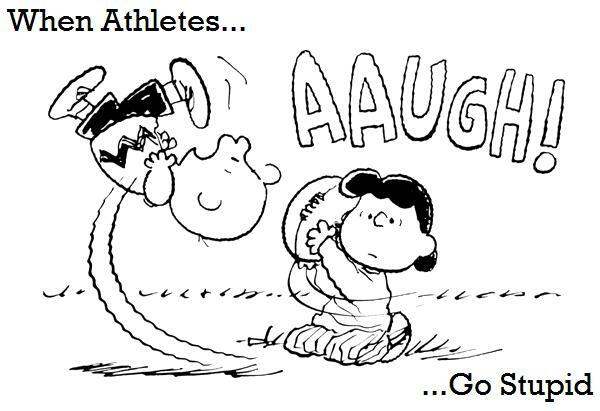 As an athlete, I completely fail when it comes to dealing with those very issues. If I am sick, I grouse about whether or not I should workout and then feel guilty if I miss. Ache or pain? Well, I seem to have a lot of those, so I tend to train through them with reckless abandon. If I have a few bad days of training, I get frustrated and tell myself I need to train harder. Fortunately, I rarely blow up in workouts; I either have a good day or a bad day, nothing in between. 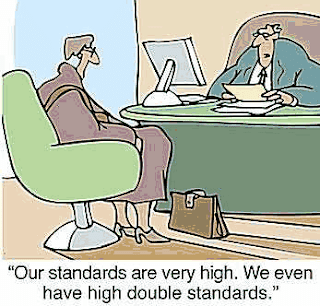 I realized the double standard is rampant in other aspects of my life as well. I was having a conversation with a fellow ellipticaller the other day and our discussion turned to serious matters of friendships and relationships. In the midst of our dialogue, in which I offered some advice (I felt qualified to intervene, as I have a counseling degree) he told me that I am very well adjusted. I nearly fell off of my elliptical, because “well adjusted” is not a trait that I am usually associated with (my family laughed hilariously when I relayed the story). Somehow my words bamboozled this unsuspecting person. You hear that doctors make the worst patients. Psychiatrists are usually maladjusted themselves. The double standard is alive and well everywhere. I know for myself, I am going to work harder to live by the words I preach. Until it doesn’t suit me, of course. My rib injury has plagued me for almost 2 ½ years. I have been fortunate not to have any other injuries crop up during this period, until now. I guess sometimes one injury just isn’t enough. I erroneously thought that one of the commandments of training is “Thou shalt not have to deal with more than one ailing body part at any given time.” Wrong. This particular injury began 5 weeks ago when I whacked my foot against the wall doing a backstroke turn. I know you are thinking to yourself, “How on earth does a seasoned swimmer like yourself make such a novice mistake?” I can only speculate that since I hate swimming backstroke I was probably daydreaming about white sandy beaches and got a little too close to the wall. I saw stars, cursed a little and scolded myself for being so mindless. Anyway, I diagnosed myself with a bone bruise and continued with my regular run schedule. My foot did not impair my ability to ambulate, although it did ache a bit. I ran Cross Country nationals, workouts, long runs, all without incident and my foot was seemingly getting better. And then, BAM, last weekend my foot started to hurt so much it crippled me. Four minutes into a run I became hobbled. I had to limp/hop back to my car. I was so convinced my foot was broken, I dragged myself and my lame foot to the abyss that is Urgent Care for an X-ray. Now, my defense mechanism in such situations is humor. I like a dose of sarcasm with a hint silly. It makes everything better. This behavior was not well received by the good people at Urgent Care (which by the way was neither urgent nor caring). When the doctor was examining my foot, I pointed out that he was very lucky that I just had my annual pedicure. Had it been a few days earlier, he would have been holding a very ragged looking foot with jagged toenails and not this lovely, cleaned up version with purple polish. He gave me an odd look that possibly implied that he thought my foot still looked grungy and gross. The doctor decided that I needed an X-ray. I replied “Oh goody! Now I have another CD to add to my collection of body parts. Pretty soon, I will be able to assemble my entire skeleton in X-ray format.” Not even a chuckle. Fortunately, the X-ray did not reveal any broken bones. 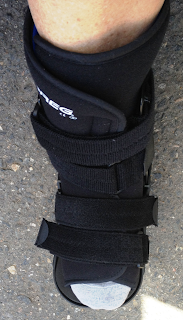 However, since I could not walk, I was given a boot. I’m not talking a cute winter boot that not only keeps your feet warm but also looks good with skirts and pants. I’m talking an ugly monstrosity of a boot that doesn’t look good with anything. Of course, I inquired whether it came in something more trendy, like animal print or camouflage. Nope. All they had was one that is too small. Can you believe these things don’t come in half sizes? I know you are jealous and want one of these for your shoe collection! Since I have not been able to run, I have become somewhat of a gym rat, excelling in the sport of elliptical. I recently discovered that the machine I like to use measures watts! That is a metric I can relate to; it has changed my whole elliptical experience. Now I can track whether I set an elliptical PR. If I can figure out how to save and download the files I will post them online for analytic purposes. Yesterday I tested out my foot by running on the Alter G. My foot hurt a lot, even at 50% body weight. At least I don’t have to go on a diet to make my foot better. It seems that there is swelling around the bone that I banged against the wall. Running on it all this time has caused so much tightness in my foot it is very immobile. It is unlike me to ignore a problem like this for so long; I usually go to physical therapy for a hangnail. With the ribs pestering me so much, though, I just couldn’t deal with another injury. I was in deep denial. But, as I have learned, and I know I am stating the obvious here: when things don’t get better they get worse.